One Day Only. Tuesday Nov. 20th, 9-9. Kanata Honda Showroom, 2500 Palladium Drive, Palladium Autopark. Extra savings on every remaining new 2018 Honda - choose from over 50 in-stock 2018s. Honda's best incentives on all the brand new 2019s. with new vehicle purchase. Good Storewide! 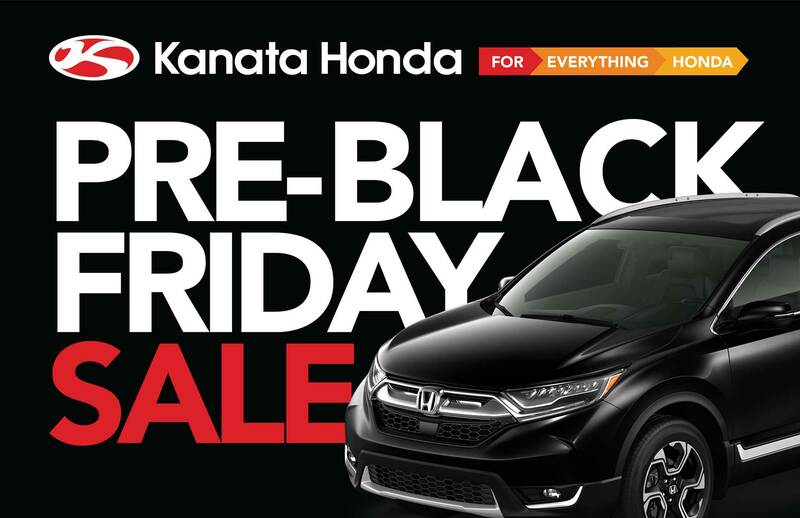 Use your $300 Kanata Honda in-store credit any way you like! Apply toward the purchase of accessories, oil changes, vehicles service and maintenance, replacement parts, winter tires, rustproofing, Honda motorcycles, ATVs, side-by-sides or Honda power equipment (snowblowers, lawnmowers, generators). Motorcycle parts, accessories, helmets and apparel too. Pre-Black Friday savings apply to over 170 in stock 2018 and 2019 models! All Civic, CR-V, Accord, Fit, HR-V, Odyssey, Pilot, Ridgeline. BONUS: $100 Friends and Family Referral Reward for you even if you are not able to take advantage of these offers yourself. Extra 1% rate reduction for current Honda Finance customers. Receive up to a 2% rate reduction if you pre-order a 2019 Fit or HR-V.
Last chance for 2018 Honda Clearout. Less than 60 remaining. Get excellent savings while they last. In store only ... shop early for best selection. DROP BY TUESDAY AND SAVE! 2018 Fits sold out! Pre-order a 2019 and save. 2018 HR-Vs sold out! Pre-order a 2019 and save. DISCLAIMER: Kanata Honda 2018 inventory figures as of Friday, November 16th at 9 AM. Some vehicles represented above may be sold out at time of event. 2018 Inventory quantities are limited.